Do you have questions about the Azores? You are not alone! More often than not I need to explain what the Acores is, where on earth they are located and other related questions. The Azores are a chain of islands created by volcanic activity that occurred over thousands of years. They were discovered in the early 1400's and settled slowly over the following centuries. The first thing I should tell you is that the islands major industries are farming, cattle (for dairy and meat) and fishing (what else would you expect in the middle of the Atlantic?). So they really do offer a good amount of old world charm. This also means that you might not always have all of the high standards of home as you travel the islands. The roads have lots of curves and some are still made of cobblestone! Don't worry, the important comforts of home are all there. The Azores Islands want Tourism to be a more significant industry so they are upgrading in the areas most important to tourists. 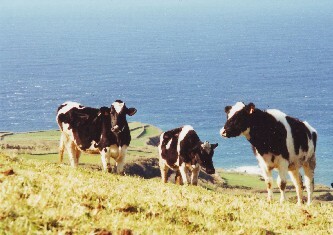 As you tour the islands you will undoubtedly encounter many farmers fields and herds of cattle. And you might even encounter cows crossing the road. I have been delayed several times by herds of cattle. It usually is just a momentary delay and if you have a sense of humour you will enjoy the diversion for a minute or two as the cattle pass your car. Are you wondering if you should visit the Acores on holidays? I have written a list of reasons why you should, and should not, go on Holidays to the Azores. Take a peek at that page after you read this one. The Islands are quite literally in the middle of the Atlantic Ocean. The distance to major cities and the continents keeps the Azores from progessing too quickly. Which is fine by me! Wondering how to spell it? In English it is with a z. In Portuguese it is with a c. I use both because I like both versions! So please do not be confused. It's just me staying in touch with my Portuguese heritage. Ponta Delgada, on San Miguel, is the capital city of the islands. It's a fun city to tour. Lots of shops, a beautiful boardwalk, churches, restaurants, nightlife, a marina, parks and more. Graciosa - the second smallest island features a huge underground lake! Corvo - the smallest of the islands (6.5 by 4km!) with less than 500 inhabitants! These islands span an area of 2300 square kilometers. They are part of Portugal. And as a result they are part of the European Union. The European Union is investing in infrastructure improvements on the islands. The last time I was there I was amazed by all the waterfront improvement projects that were underway. These projects included new boardwalks and swimming areas that tourists would enjoy immensely. They are part of the European Union and use the Euro. The islands are in their own time zone! The time zone is known as the Azores Time Zone and it is GMT -1 (Greenwich Mean Time - 1). They are a 4 hour difference (-4) from Toronto, New York city and Miami (4 hours ahead). And they are a 1 hour difference (+1) from Lisbon and London (1 hour behind). The primary and official language of the Islands is Portuguese. I do not speak much portuguese and found that you can do well with a few basic phrases. And you can almost always find someone who speaks English as it is taught in the schools and they Azoreans are trying to encourage tourism. I try hard to show my manners and respect for the culture by learning as much of the language as I can each time I go. A word of advice If you buy a Portuguese - English Dictionary make sure it is for Portugal's Portuguese, not Brazil's Portuguese! There are substantial differences that were big enough for me to royally confuse some poor Azoreans (including my dad) when I tried to impress them with my new found language skills. Ah well, you can learn from my mistakes ... that's what the site is for! Return to Magical Azores Islands home (leave about the Azores).